These Two Hands » Blog Archive » Beach house #21 – happy deck! « Beach house #20 – sad miters. 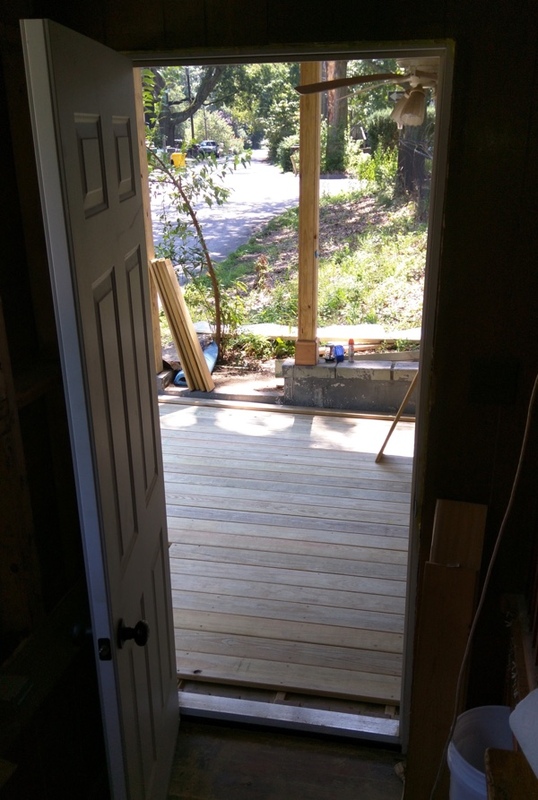 Beach house #21 – happy deck! 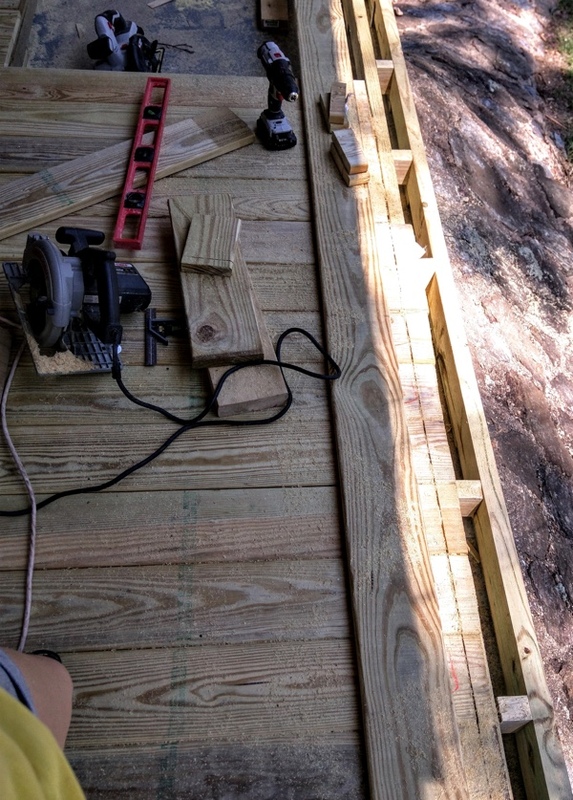 I got the rest of the decking boards laid! It looks great! 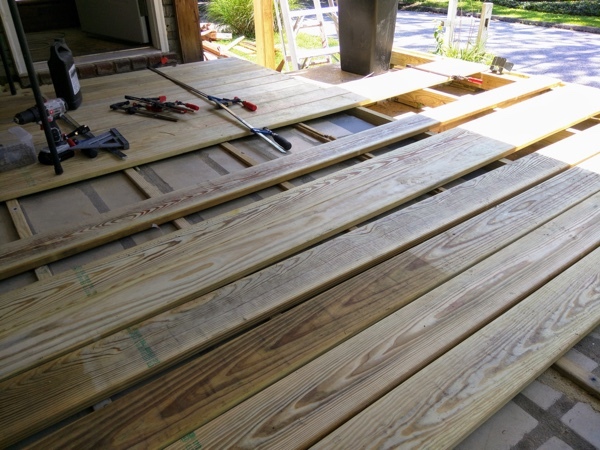 I kind of love the color of the boards just as-is, though they are going to be stained and sealed. Laying the 1x6x12 perpendicular to the others like that solved three problems. 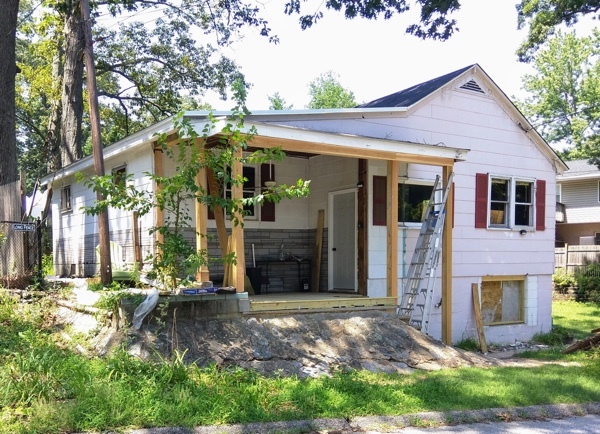 1) it eliminated the need to lay lots of very small boards across the slender arm of the street-side of the landing. 2) it eliminates any visible cut ends from the street. 3) it let us buy 24 10′ boards instead of 12′ boards, which saved us a tidy $60 or so. 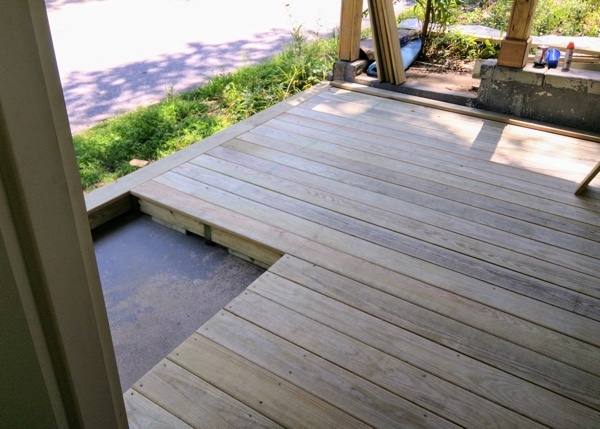 By the way, that landing is there because the space from the top of the staircase, all the way up to the highest point that we could have laid the deck (level with the door threshold), was only 6 1/4″, a full 1 1/4″ shorter than all the rest of the stairs on the staircase. This change in step height dictated that by code, we must install a 36″ landing at the top of the stairs. So we had to have a landing, and I didn’t want 1) a lonely little naked column all by itself, or 2) a cut-off-looking fascia board visible from the street. I wanted a single, solid line all the way across. So we ended up building this little arm. I think it works well and ties everything together. I’m so proud of how neatly it fits against the decking! I had to lay them all first, wedge and squeeze and clamp them together, and then use the same board as a template for a circular saw cut across all of them at once. This entry was posted on Friday, August 18th, 2017 at 5:35 pm	and is filed under rehab. You can follow any responses to this entry through the RSS 2.0 feed. You can leave a response, or trackback from your own site. Atom, Entries (RSS .92), (RSS 2.0) and Comments (RSS 2.0). 26 queries. 0.255 seconds. Top.